Because Anemone berlandieri is endemic to Central Texas, most years I make only enough of this tincture for personal use. However, because we had a Winter of such abundant rain, this Spring brought with it a profusion of blooms which allowed me to respectfully harvest enough of this medicine to share with you. This small batch offering is sure to sell out quickly. Anemone berlandieri is a Texas medicine I have come to love. The flowers are ephemerals: delicate blooms which rise and fall in the space between seasons. Each bright blossom serves as a herald of the coming spring and all the hope it holds within its span. These unassuming yet powerful flowers offer fast relief from generalized anxiety, acute panic, and the sensory overload that often accompanies PTSD and c-PTSD. They are a particularly valuable ally for highly sensitive persons. Their medicine works to dramatically deepen the breath and relax tension in the body. They soothe frenetic energy and relieve feelings of shakiness, replacing them with a sense of safety and solidity. Anemone is specifically indicated for anyone who has shut others out as a means of self-protection. So many of us feel lonely and long for connection but don't know how to let life in. This medicine supports us in learning to trust again so that we can experience safe and satisfying communion with the world beyond ourselves. As we do the deeper work of healing from past hurts, the medicine of anemone helps us to rediscover a visceral sense of inner-refuge. Its medicine reminds us that peace is possible and that our hearts can be our homes, even after we’ve experienced devastating shock, loss, or trauma. Anemone helps us to soften and surrender to the winds of life; to loosen our grasp and to rediscover the inviolable sense of safety that is always alive within and waiting to welcome us home to ourselves. 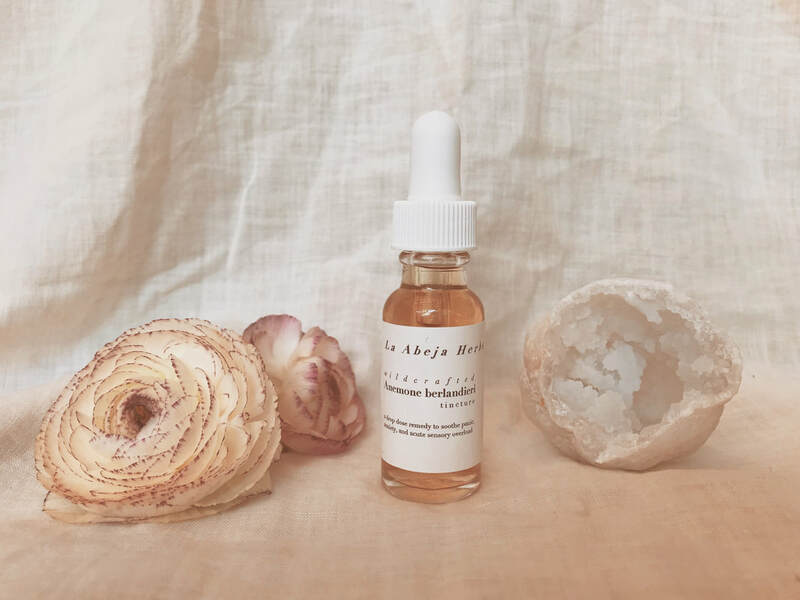 This tincture is made with Anemone berlandieri flowers extracted into gluten-free spirits It is a strong medicine to be used with great care. Keep out of reach of children and do not exceed the recommended dosage of one to six drops, up to four times daily. If you live within the bioregion to which A. berlandieri is endemic (see map) we would love to send you a small package of wild-harvested seeds so that you can join us in stewarding this valuable medicinal ally! Please let us know in your notes to seller if you would like to receive seeds free of charge. UPDATE // This medicine is sold out. Since it was such a small batch offering, all bottles were purchased within half an hour of listing. If you'd like to be the first to know when (and if) we re-stock the Anemone tincture, please leave your email in the form at right.